Picking up from the 1980 single 'What You're Proposing' and running through to the 1984 release 'Going Down Town Tonight', this twelve disc 7" singles box-set is the second in a limited series of five – part one, covering 1970 to 1979, being released earlier in the year. Housed in a beautiful box and with a booklet featuring quotes, history and images of the singles, including some rare foreign sleeves, each of the heavyweight vinyls come in either the original art, or "house label" sleeve they were released in. 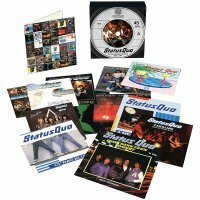 Unlike the band's earlier years, exclusive B-sides were harder to come by for Quo fans during the eighties, only the flip tracks of '...Proposing' and 'Jealousy' – which wasn't actually released as a single in the UK – graced with non-album cuts. The first of the two has the languid instrumental, 'A B Blues', offering up not too much real excitement, while the latter finds 'Calling The Shots' following the guitar/keyboard tussle for supremacy that the band's music was based around at the time. It's a decent song, but equally it's easy to hear why it didn't make the '1+9+8+2' album the A-side comes from. Also featured here are the versions of 'Caroline', backed by 'Dirty Water', that were recorded 'Live At The NEC' and released on the 1981 album of that name. It's a cracking run through of a genuinely classic song, while '...Water' also stands up extremely well in this setting. 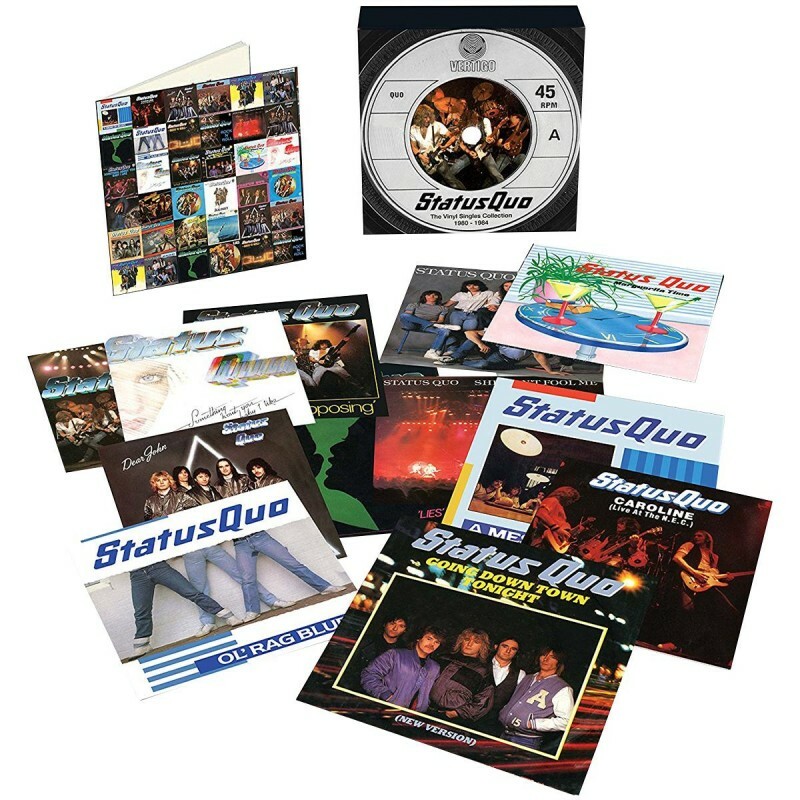 In terms of albums, this era of Quo is seen by some as a dip in form, yet as far as their singles were concerned, the band were still as strong as ever, only 'She Don't Fool Me', also from '1+9+8+2', not breaking into the Top Twenty. In fact, with 'Lies', 'Something 'Bout You Baby I Like', 'Dear John', 'Ol' Rag Blues' and 'Mess Of The Blues' all included here, you could argue they'd never been stronger. Add in the live tracks, cult hit 'Marguerita Time' and seductive 'Rock 'n' Roll' and the class is evident throughout. There's no denying that having the chance to own the complete singles discography in brand spanking new versions of the format they were originally released in, is a thoroughly tempting prospect. The hefty price tag on these sets may make them a purchase for dedicated fans only, but those that do take the plunge won't be disappointed.